About three years ago I left my post as the director of sales for a popular restaurant group in Washington DC. After 22 years in the restaurant industry my spirit had had enough! But...three years before I left the owners of the restaurants and I began a charity golf tournament called the ComPassion Golf Tournament. When I left the company, I stayed on as a volunteer planner/coordinator for this tournament and it's kind of a been a little baby of mine. For the first five years, our beneficiary was the Children's National Medical Center in D.C. Or as most people call it, Children's Hospital. 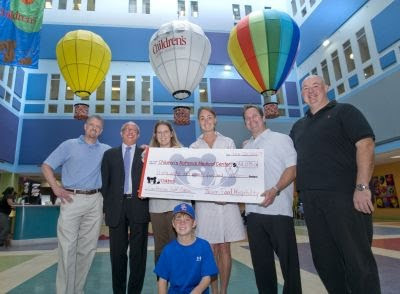 In five years, we donated over $160,000.00 to the hospital. This year, our sixth, we are changing things up a bit! Our beneficiary this year is The Children's Inn at NIH. "The Children's Inn at the National Institutes of Health is a residential "place like home" for sick children and their families. Children come from across the country and around the world to stay together with their families in The Inn's healing environment while receiving groundbreaking medical treatments at the NIH, the world's leading biomedical research center. While the NIH takes care of the child's medical needs, The Inn tends to the child's heart, soul and spirit." That last line makes me weep just about every time! Because really, when you are that sick, your heart, soul and spirit really do need healing! Families receiving treatment at NIH stay at The Inn free of charge. I can hardly bear to think of how I would feel and cope being in the shoes of the families who stay at The Inn. The Inn does amazing work in caring for the child and the families who are going through a tremendously difficult time. In addition to changing our beneficiary this year, we are also adding a spa component to the day! Red Door is partnering with us to offer "mini-services". Then after a day of golf and/or an afternoon at our mini-spa...our golfers and our spa goers, will meet up at our awards reception for great food, drink and amazing silent auction and raffle items! Our thinking was this....we've only raised between $30,000-$40,000 each year...but we want to do better than that!!! We attract a lot of guys to our golf tournament, but we realize that it's us ladies, who really get interested in the silent auction items and the raffles! So we added the spa element to diversify our crowd, increase attendance and raise more money for our intended charity!!! "ComPassion Golf or Get Gorgeous"
Any ideas or thoughts from any of you? Got my beads for the Party!